Beyond the headline figures, here are some key metrics to examine in the fixed-income specialist's upcoming second-quarter results. Shares of MarketAxess Holdings (NASDAQ:MKTX) are on a tear, with the electronic bond-trading platform's stock up more than 35% in value so far this year. 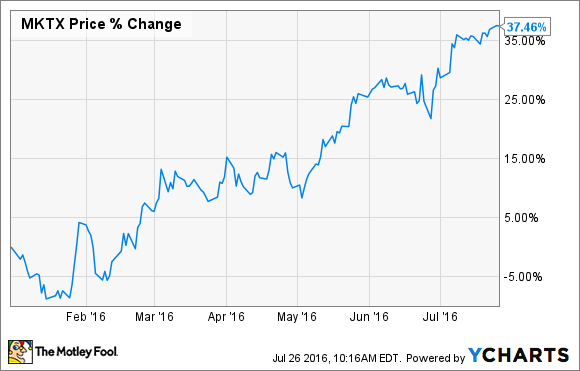 Will that impressive performance continue when MarketAxess reports earnings on July 28? Here are some key items to look for in MarketAxess' second-quarter results that will likely help to determine the answer to that question. MarketAxess has enjoyed strong increases in market share across its core products in recent years. Particularly noteworthy was the company's increased share of the U.S. high-grade corporate credit market to an estimated 14.9% in the first quarter, up from 13.7% in the prior-year period, which continued a trend of impressive share gains since the second quarter of 2014. Image source: MarketAxess Q1 2016 earnings presentation (link opens PDF). In the second quarter, investors will be looking for more market share gains in U.S. high-grade and high-yield bonds, as well as continued growth in MarketAxess' European and emerging market fixed-income operations. MarketAxess' business model is highly scalable, as the company can add new users to its bond-trading platform with minimal incremental expense. Yet in Q1 2016, MarketAxess' operating expenses actually grew at a slightly higher rate than the company's revenue, at 15.5% versus 15.4%. MarketAxess is currently investing in its employees by growing its head count, a prudent move considering how large of a market opportunity the company still has before it. But investors will want to see MarketAxess remain disciplined in its expense management in future quarters, and a return to a situation where revenue growth is once again outpacing operating expense growth would likely be well received by investors. Although the financial markets have largely recovered from the shock of the Brexit vote, the plunge in global bond yields that has occurred since the referendum will likely still impact MarketAxess' business. While MarketAxess has enjoyed strong demand for its Open Trading platform since launching the service for European credit products in January 2015, the company recently announced that European bond trading volumes fell in recent months as stricter financial regulation, scaled back market-making activity by banks, and lower bond yields have all helped to reduce trading volume. Investors will want to know just how large an impact these factors had on MarketAxess' business in the second quarter, as well as management's expectations as to their impact in the quarters ahead. MarketAxess will announce its second-quarter financial results on Thursday, July 28, before the financial markets open. Investors can tune in to its live conference call, where management will discuss the quarter's results at 9:30 a.m. ET. Both the release and a link to the conference call will be available at the company's investor relations website.